CHEERIO: Rod Sarich, taking the applause of the Steelers' fans after a victory against Nottingham in October last year. In the end, he went on his own terms. But, from Rod Sarich, you would expect nothing else. As if losing two club legends at the end of the 2015-16 season in Jeff Legue and Jason Hewitt was not hard enough for the club’s fans to stomach, news that a third long-serving favourite will not be lacing up come August is the last thing they will want to hear. Rod Sarich, celebrating the 2009 play-off triumph with Sheffield Steelers under Dave Matsos. But, after 10 seasons in South Yorkshire - interrupted by a year out due to the forgettable Doug Christiansen regime - nobody will begrudge Sarich opting to head through the exit door without any fanfare. Just the way he wanted it. Sarich exits fifth in the club’s all-time appearance list with 577 games. One of the club’s most prolific scoring defenceman and so often a key ingredient of their powerplay unit with Legue, he scored 81 goals and 279 assists. FROM THE ARCHIVE - Have a read of a handful of Rod Sarich’s unique online blog entries for The Yorkshire Post from back in 2012. Last night, after back-to-back championships took his regular season title tally to four since joining under Dave Matsos in 2006, Sarich paid tribute to the club and its fans for making his time in the UK top-flight so memorable. I’m a much different person from the 24-year-old who showed up back in 2005. I’ve enjoyed every minute. “I’m a much different person from the 24-year-old who showed up back in 2005 and now, with a family, the timing is right for me to move on to other things,” said Sarich, a former online columnist for The Yorkshire Post, who has also won three-play-off titles. “I’ve got a long list of DIY jobs built up over the years! “It’s been a real pleasure and honour to play for the Steelers and I’ve enjoyed every minute. “Having a year out in 2013-14 was not part of the plan but coming back gave me an even greater appreciation for the game and the time spent with the boys. Sarich celebrates a win over Manchester Storm during the 2015-16 season. Picture: Dean Woolley. 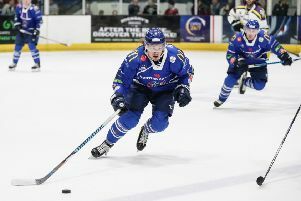 The club announced the retirements of Sarich’s long-standing team-mates Legue and Hewitt within 48 hours of securing the league title in Fife but, according to Steelers’ head coach Paul Thompson, Sarich preferred to keep his plans to exit the game quiet - avoiding any fanfare. “Rod spoke to me before the end of the season and advised me of his plans,” said Thompson. “He didn’t want the fanfare of leaving us and asked us to not include him in the post-season celebrations that included Hewey and Leggy. “That’s the kind of guy Rod is, we wanted to wave the flags for him because he has been an exceptional player and a huge part of this organisation over many years. “He is a smart hockey player and he has a hockey brain. That will be a tough component to replace this summer. IN FULL FLIGHT: Rod Sarich, in action against Edinburgh Capitals during the title-winning 2015-16 campaign. Picture: Dean Woolley.